Sonos has a colorful new competitor on its hands in the form of Pure’s Jongo multiroom music system. Unveiled at CES in January, the company announced Wednesday that it was now shipping several components of the system in the U.S. with an additional product coming later this year. The $199 Jongo S3 is a portable, rechargeable wireless speaker that offers four tweeters and an upward-firing subwoofer. With those speakers you can shoot sound in all directions or enjoy directional stereo sound instead. You can stream music directly to it over Bluetooth (via an included dongle) from a computer or mobile device, or using Wi-Fi to listen on one or more devices around the house. The S3 has a total of 20 watts, and Pure claims “at least 10 hours” of listening on a charge. The $129 Jongo A2 adapter lets you connect to an existing audio system and turn it into a music streamer. If you already have good speakers you can enjoy the benefits of Jongo streaming with presumably better quality than Pure’s standalone products. Is has a 24-bit internal DAC and both optical and coaxial digital, as well as dual RCA analog, audio outputs. Although the standard color schemes are rather boring—black or piano (white with black covers)—you can pick up speaker grills and clip-on covers in more exciting burnt orange, lime green, mango, and white varieties (starting at $30 for the S3 and $20 for the A2). You control Wi-Fi playback using the Pure Connect app for iOS and Android, which works on iPhones, iPod touches, and iPads running iOS 5 or later; and devices running Android 2.3 or later, respectively. There is no desktop software for Macs or Windows PCs to control Jongo hardware, however. With a free Pure Connect account you can stream Internet radio, on-demand programming, and (oddly) nature sounds. 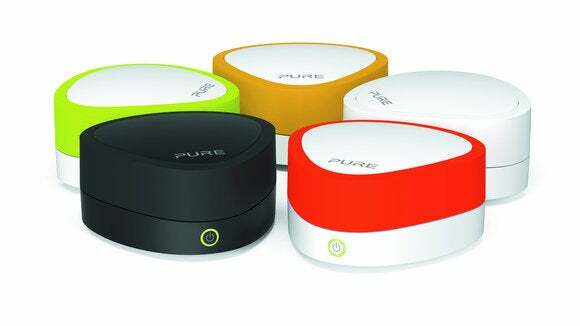 But Pure is also planning to bring its Pure Music on-demand music service in the U.S. for an undisclosed monthly fee sometime in 2013. (Currently live in the UK and Germany, Pure Music costs £5 and €5, respectively.) The addition of Pure Music will be a good thing because Jongo doesn’t directly support the other subscription music services (Spotify, Rdio, Mog, Rhapsody, or Slacker) or even the ubiquitous Pandora—although you can stream that content from your mobile device instead.